I'm always looking for fun, simple and unique DIY edible gifts during the holiday season. These Holiday Hot Cocoa Chocolate Stir Sticks totally fit the bill. They are inexpensive to make, fun to have the kids help with and make great little gifts. They'd be awesome tucked into a new Christmas mug along with a candy cane and a small packet of hot cocoa for gift-giving. These little chocolate stirrers totally amp up the flavor and richness of a basic mug of hot cocoa ... the result is like, next level hot chocolate. To put these together, you'll need an ice cube tray (I used a square-welled silicone one) or a mini muffin tin. You'll need, also, to decide on some type of "handle" to insert (I used striped paper straws that I cut in half). Popsicle sticks or lollipop sticks would work great, too. Then, you'll melt down a bag of chocolate chips and spoon the melted chocolate into the tray wells. Once your "handle" is inserted, embellish with whatever you choose (crushed candy canes, chopped chocolate mints, sprinkles, finishing sugar, etc.) Once the chocolate hardens in the fridge or freezer, you're all set to serve them up or package for gifting. If you look closely in the photo above, you'll notice that I placed one stirrer in a small, clear bag along with some mini marshmallows. I finished the package with some festive ribbon. Note that the number of stir sticks you'll get will fully depend on the size of the wells of your ice cube tray or mini muffin tin. One twelve-ounce package of semi-sweet chocolate chips yielded twelve stir sticks in the tray that I used (size shown in photo above). Place in refrigerator for thirty minutes or freezer for fifteen minutes to harden. Carefully remove from mold(s). Store in airtight container until needed. 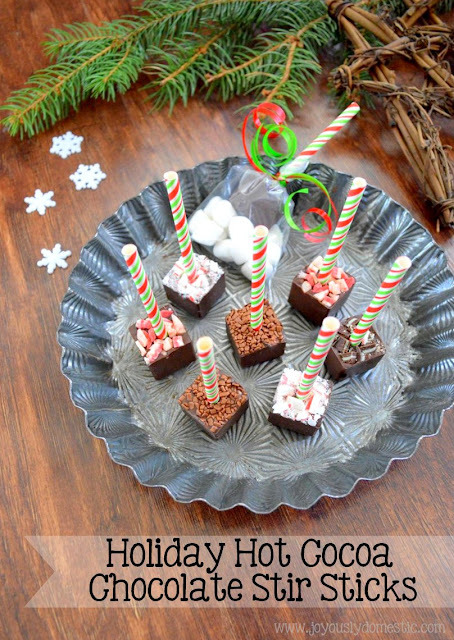 Serve with hot cocoa or package for gift giving. I thought so, Kari. :) Merry Christmas! Why not use candy canes for the handles?